It’s finally time to announce: Geek Mountain State and Burlington’s Renegade Writer’s Collective will be hosting a joint event: the Strange as Science, Dark as Night reading! This science fiction / fantasy themed reading will take place at the RWC’s new headquarters at The Karma Bird House at 47 Maple St. in Burlington from 7pm to 9:30pm. 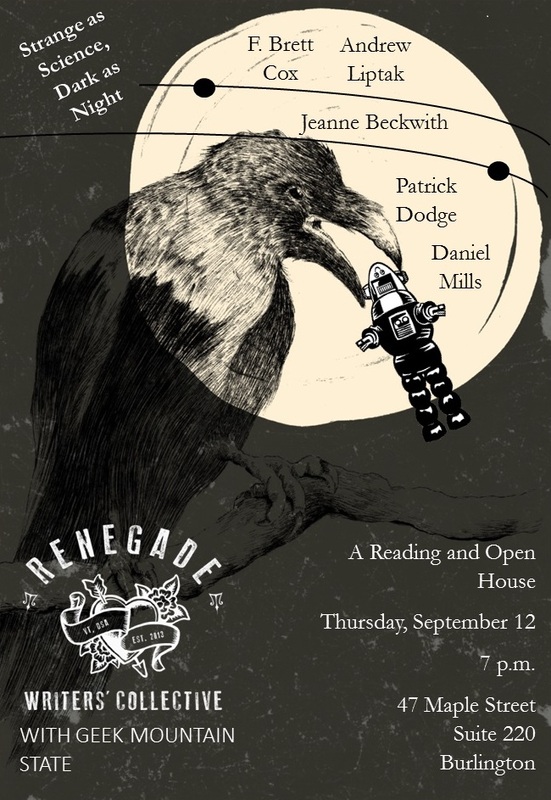 The reading will feature a number of Vermont science fiction and fantasy authors: Daniel Mills, Patrick Dodge, F. Brett Cox, Jeanne Beckwith and myself! This will be the first physical Geek Mountain State meetup, and we’d like to encourage all of our readers to come out: we’ve spoken a lot online on Facebook and Twitter, and now, we’d love to meet up with folks in person!